No wonder the public is increasingly sceptical about these kind of knee-jerk claims and predictions. The unprecedented snowfall and prolonged cold weather in the Himalayan region this winter was caused by global warming, a weather scientist in Almora said Monday. The trend will continue in the coming years as global weather patterns are changing rapidly, said Dr Sandeepan Mukherjee, a weather scientist at GB Pant National Institute of Himalayan Environment and Sustainable Development based at Kosi in Almora. “The erratic patterns of western disturbances, that cause rain and snowfall in winter months in the northern part of the globe, have become so due to the changing patterns of weather caused by global warming,” he said. “It seems these erratic patterns will continue in the coming years with increase in global warming,” he added. The first spell of rain and snowfall this winter was received in the Himalayan region on December 12 and the last was received as late as on March 13, residents of Munsiyari in Pithoragarh district said. “There were 24 spells of snowfall in Munsiyari between December 12 and March 13 this year which broke the record of 1972 when there were 15 snowfalls,” Puran Pandey, a local said. Another buffoon, so much for th edemise of teh glaciers then. This is re-inforced by the story at NoTricksZone where the Austrian Alps have been cooling for the last 30 years also of course due to Global Warming. Wonderful stuff this Global Warming. It is high time to also discount the statement “scientists” say. Just who are they? Where did they go to school? What have they done that we should pay them any mind? In other words, do they have any real credentials and what are they? Having a piece of paper on their wall does not give them the pulpit. The Deniers book answers you in part when having shown that contrary to the claimed consensus lots of esteemed people did not agree with global warming, it closes with a look at the alarmists and their achievements. Outside the climate science fiction world their achievements amount to a blank page, unlike the deniers who have many acolades. Science is a group of facts and hypotheses which are proposed and tested by observation and experimentation/research with regard to phenomena. Science is NOT and never can be a consensus. Just got posted w/o posting. 1. Define the problem or question. 2. Research the problem–is it new? ; does it need investigation? Erratic patterns of western disturbances just about sums it up – western green luddism. Monsoons, like the ENSOs are always erratic..unpredictable. Unlike some climate “scientists” who are very predictable. Could the changes be due to the variation in the path of the jetstream caused by the coming of solar minimum? The alarmists have never predicted a change to a meridional path as opposed to the zonal path. So it’s NOT global warming, it’s LOCAL warming or LOCAL cooling. Which makes it weather. Now, if we call it climate change, it’s always snowed in the Himalayas and the news media has zero idea of what the word “unprecedented” means and use it without any regard to context, so still, no climate change. 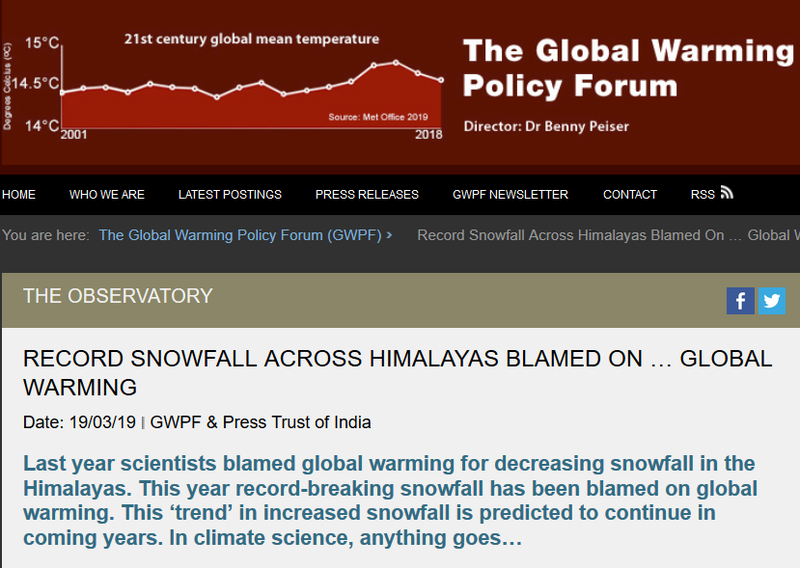 Climate change would mean no snow falls in the Himalayas. Yet snow does fall. It’s all LOCAL, not global. If global warming causes cold winters does global cooling cause cold winters too? Must be the warmest snow ever – how long can this nonsense on stilts go on? When there were wild fires in California it was all over the news and opinions – even the governor – how it was due to “human-caused climate change”. Now that even Southern California has cold and rainy weather they are silent. Check out the cartoon on http://www.iceagenow.info for some lighthearted relief. Maybe the scientists and/or journalists should’ve got out of their echo chamber and gone to talk to some of the people living in these areas. I bet the locals aren’t worried about climate change, just happy that there will be plenty of melt water to irrigate their crops this year. If you cancel warming areas with cooling areas, I suspect the only remaining warming area – the one responsible for tge net global warming – will be the Arctic. (An area with poor data.) The question needs asking, then, why just the Arctic when CO2 is global? Continuing this line: if warming CO2 is global, why are some areas cooling? If the answer is, “More clouds and/more cold upwelling water”, you coukd flip this to the warming areas: less clouds/less upwelling cold water”. The temperature regionality of a global CO2 phenomenon needs more discussion. To simply say there are shifts isn’t enough. Shifts happen in weather, not just CO2 climate. If the poor people of the world gonna die because of shifts, the shifts have to be permanent. We need to see that (and not like Californian drought “permanent”).